Welcome to ELAWR's Official Website! The Early Literacy Alliance of Waterloo Region (ELAWR), in collaboration with Overlap Associates, is currently working on the “Prescription for Literacy” project. The aim of the project is to reach out to the health care community – a universal access point for families – to highlight a critical window of opportunity for early literacy development. We are on Instagram,Twitter and Facebook! Please follow earlyliteracyalliancewr on Instagram; @EarlyLiteracyWR on Twitter and @EarlyLiteracyAllianceOfWaterlooRegion on Facebook for up-to-date information on all things related to early literacy. 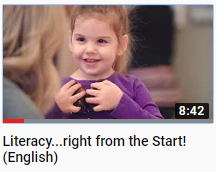 ﻿﻿﻿﻿﻿﻿﻿﻿﻿﻿The Early Literacy Alliance of Waterloo Region is a collaborative of service providers committed to improving the literacy skills of children from birth to age 6. The Alliance was formed in January 2009 due to an identified community need to share information about programs, services and best practices related to early literacy. As of the summer of 2012 we have expanded to 19 member organizations. We believe that children must develop early literacy skills before learning to read and write on their own. The emphasis on literacy needs to start at the beginning of a child’s life. Children with strong early literacy skills are more likely to have success in school and in life. ELAWR’s goals include education, communication, and promotion of literacy materials, strategies, events and initiatives with service providers and families. Visit the Events Page to Find Out What Community Events are happening! Interested in learning about Family Literacy? Click here to discover how you can earn a Family Literacy Certificate through Conestoga College's part-time studies.